Once upon a time, the hiring manager ruled the hiring process. The hiring manager was king and reigned over everything from sorting resumes to screening candidates to conducting interviews and making the final hiring decision. There’s since been a hiring process revolution, and more and more companies are adopting collaborative hiring models. The power in hiring is now distributed between the direct manager, recruiters, and the rest of the hiring manager’s team. This team-based approach is powerful and can be an effective way to find the best candidate for the job. Not every employee is a trained hiring professional. Team managers and members are going to be looking out for their best interest during the hiring process and may not have the experience or insight to identify the best candidate. Team members who will be working closely with the new hire may judge candidates based on their personality, not their skills. After all, a 2014 report from Globoforce found that 78 percent of people who work 30 to 50 hours a week spend more time with their co-workers than their families, and 89 percent said that these relationships are important to their quality of life. Office friendships are important to employees, and they may lean toward candidates they like on a personal level instead of those who are best suited to do the job. Solution: To keep the collaborative hiring process from turning into a popularity contest, get team members involved from the start. When drafting the job post and responsibilities for the role, have employees contribute. They are the ones who will be directly working with the new hire. If they voice their needs and help set the requirements for the job, they will be reminded that they need this person as a co-worker — not a friend. Although cultural fit is important, focusing employees on the responsibilities of the role will remind them that they need someone who will pull their own weight and perform well in the position. Even when the team is looking at the skills and experience needed for the job and the personality of the candidate, everyone is not always going to agree. Your favorite candidate may rub one of your employees the wrong way, or a recruiter might be rooting for a candidate that everyone else doesn’t like. Strong opinions can cause tension, and if everyone can’t come to a unanimous decision, or if you disagree with the majority, you’re going to need to step in and make the final call. But making the decision based on what you think is best can alienate employees and make them feel like their opinions don’t matter. In fact, a survey of U.S. employees published by 15Five in March found that just 15 percent of employees think their feedback is highly valued by managers. If employees feel like their opinions aren’t taken seriously, they likely won’t contribute to the conversation in the future. And if employees aren’t contributing, then it’s not really a collaborative hiring process. Solution: Be open and transparent with recruiters and employees throughout the hiring process. Let them know from the start that although their opinions are important, you do have the final say if it comes down to it. Then during the selection process, communicate your thoughts about each candidate. Let them know who you like, who you don’t like, and why. An open conversation will encourage employees to speak up and share their own opinions. If you disagree with an employee, don’t brush off their opinion. Consider it, and give specific reasons why you feel differently. This way, employees know you heard them and value their input. It’s time to schedule the interview, and you want everyone to be there. It’s a scheduling nightmare. The supervisor is only available on Tuesday mornings, but the team members are open on Wednesday afternoons. Then you need to consider the candidate’s schedule, and your own. You have 2 options – you can schedule multiple interviews with different interviewers, or you can wait to schedule the interview in a few weeks when everyone can meet at the same time. Both options aren’t great. Multiple interviews means a longer interview process, which is frustrating to candidates and wastes time and money. Interviews are already getting longer and more tedious for everyone involved, lengthening the time to hire. According to new data from the Dice-DFH Vacancy Duration Measure, it took an average of 26.6 days to fill jobs in June. Your employees are spending more time hiring and less time on their other responsibilities, and your position stays open longer. If you push the interview back until everyone can attend, you’re making the candidate wait. Jobs seekers need jobs, and they can’t afford extensive amounts of time, especially if they’re considering other opportunities. Solution: Avoid the scheduling mess that comes with collaborative hiring and get everyone involved in the process with one-way video interviews. In a one-way video interview, the candidate is given interview questions and records their answers on their own time. Then, employees involved in the hiring process can view the video on their own without needing to be in the same room at the same time. Then, you can all discuss the candidate together. After receiving everyone’s feedback, you can schedule a follow-up interview with just yourself and the candidate if needed. With or without a follow-up interview, the one-way video interviews speed up the collaborative hiring process and make it easier to manage. Let’s say you do find a time for an interview — either in person or via video — that works for everyone involved. The interview doesn’t start well. A few employees are running late, and the candidate has to wait for them to show up. When the interview finally starts, it’s clear members of the team haven’t looked at the candidate’s application materials. They’re asking very basic questions in an effort to get familiar with the candidate. Meanwhile, you need to get to the meat of interview. As the interview goes on, things get even more out of hand. It seems everyone is more concerned about asking questions and speaking during the interview than what the candidate is actually saying. Team members are interrupting one another and talking over the candidate. As a result, no one has learned much and the chaos has turned the candidate off. This doesn’t come as much of a surprise, considering a survey of more than 20,000 professionals around the world conducted by LinkedIn in February and March found that 83 percent of respondents said a negative interview experience can change their mind about a position or company they previously liked. Solution: Avoid unprofessional interviews by setting clear roles and expectations. To eliminate the competition to speak, assign one person to lead the interview. This person will do the majority of the talking and answering. Task everyone else with listening to the candidate’s answers and taking notes. While everyone can — and should — ask follow-up questions as they come up, they shouldn’t be asking the main interview questions. Instead, they should ask for clarification on the candidate’s answers. Another option is to avoid the panel interview altogether. Consider conducting a one-way video interview to screen candidates. Have everyone on the collaborative hiring team watch the videos and make their suggestions on who should move onto the next round. Then, have team members and recruiters give their input on the questions that should be asked during the follow-up interview with you and the candidate. This way, the team is still involved in the interview process and you avoid unwanted drama. When you first started hiring collaboratively, everyone was excited. They actively reviewed application materials, participated in interviews, and voiced their opinions about candidates. But after some time, the novelty has worn off. Employees aren’t engaged in the process. They’re contributing less and see the hiring process as another task to check off. Instead of a collaborative conversation, you have another boring meeting that isn’t doing much but wasting everyone’s time. If you’ve had a position open for a while, your team will likely get burned out — they’ll be tired and frustrated with the hiring process. Every candidate will begin to look the same, and team members will want to hire just about anyone for the job. Solution: Engage your team by sharing responsibility of tasks. Don’t assign pointless busy work that feels like homework. Don’t ask each team member to come in with a list of five things they like and dislike about each candidate, or to fill out a worksheet for each finalist. Instead, give employees more active roles. Each team member could be responsible for presenting the information about a specific candidate to everyone, or team members could draft an interview agenda and questions. By assigning sharing responsibility and tasks, each team member will need to take an active role in the hiring process. Keep your hiring team engaged by assigning more active roles and sharing responsibility of tasks. In an ideal collaborative group setting, individuals voice their own opinions and the group discusses them to come to a general consensus. But certain voices can overpower others, and a consensus may be reached before everyone has a chance to say what they think. In addition, some employees may be uncomfortable disagreeing with their co-workers and voicing opposing opinions. Others may be afraid to be wrong and don’t want to contradict what a team member says because they think they will sound stupid. Your group discussion is reduced to a single speech that everyone nods in agreement with. Although you want your team to agree on the best candidate, if you come to that conclusion with little discussion, you may have a problem. Instead of collaboration, you have groupthink. Everyone wants to belong with the team, so they all conform to the same opinion. Solution: Have team members review application materials and video interviews on their own before discussing candidates as a group. This way, employees have a chance to form their own opinions before being influenced by the group as a whole. During the discussion, encourage everyone to share their views. If everyone offers the same opinion, play devil’s advocate. Bring up the concerns you may have about a candidate or bring up an opposing opinion to encourage employees to do the same. Collaborative hiring is a powerful way to engage the team and chose the best person for your open position. But it’s not magic. Just like any other process in the workplace, reevalute the system and continue to make adjustments to keep the hiring process effective. 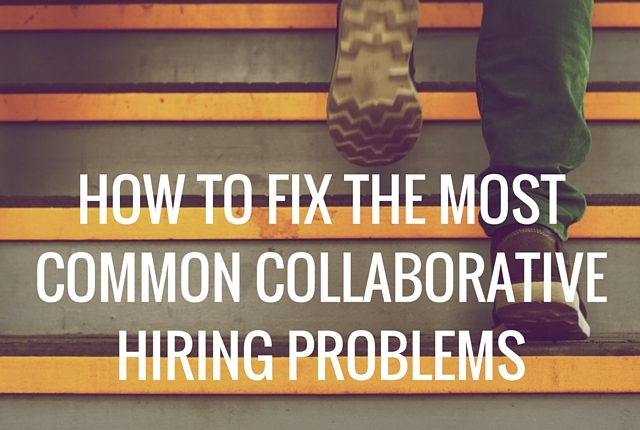 What strategies do you use for an effective collaborative hiring process? Let us know in the comments below!